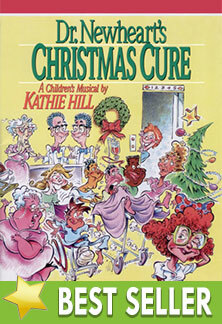 Dr. Newheart's Christmas Cure : Kathie Hill Music, LLC, Making music with and for kids for over 25 years! Kathie's Note: Because people so loved the characters in this musical, it ended up becoming the prequel to Dr. Newheart’s Neck-Up Check Up released in 1998. You need strong actors or enough time to help children pull off the over-blown characters that provide constant humor throughout the script. But that comedy and the “Disneyesque” orchestral arrangements make this Broadway-styled musical one that people want to present over and over again. I know I did! Digital download of an edited Listening CD & water-marked Singer's Book for preview purposes only. Downloadable book with script, all songs in leadline only & activities with permission to make 3 copies. Additional copies require purchase of additional 3x license/s.